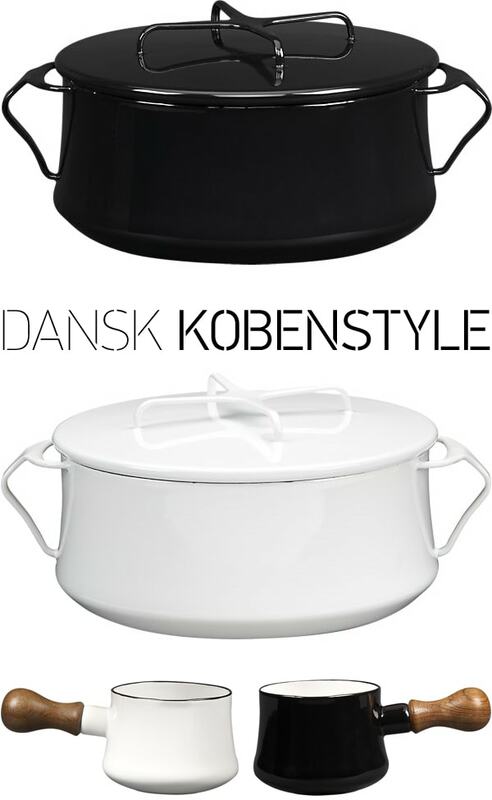 I’m not sure how I missed this until now (and I apologize if it’s old news), but Dansk Kobenstyle cookware has been reissued and is now being sold at Crate & Barrel. There are two casseroles, a baking pan and a wooden-handled saucepan, each available in black, white and red. Nice! The Kobenstyle line was designed by Jens Quistgaard, the co-founder of Dansk, in 1956. It’s been out of production for more than 20 years now, so this reintroduction is very exciting. Did you know that the X-handled lid doubles as a trivet and makes the pots stackable? Yup. I love enameled cookware, and I’ve been admiring Kobenstyle stuff for a long time. I kind of feel like a jerk for saying this, but what’s held me back from buying any thus far is that I’m not all that into the colors of the vintage pieces (here’s a rather beautiful collection), at least in my house. I like the way those colors look in other people’s kitchens, but…well, you know me! I had a similar reaction when C&B’s new catalog arrived this weekend. The new colors are great and it’s nice to have the possibility of a matching, chipless set with lids included. What’s held me back is that durability-wise and in terms of heat distribution, enameled cast iron (like Le Creuset & similar) seems to be widely preferred over enamel-coated steel in the kitchen. Still… it’s hard to beat that Kobenstyle lid! Related, but unrelated… the September issue of Elle Decor says that Dansk.com will be bringing back Kobenstyle as well in midnight blue, white, and chili red. So far, Dansk’s website doesn’t have it up, though. After I saw the C&B flier over the weekend (that’s how I found out about the re-introduction), I googled and found an Apartment Therapy post from a while back showing those as the color options that were going to be available (exclusively at C&B). I wonder if they just decided to replace midnight blue with black? It’s hard to say. The picture in Elle Decor shows a totally different set with a lidded saucepan, a frying pan, and a lidded casserole. The wooden handles are different too—they’re a lighter color of wood and have a more subtle flare without the knobby end. They don’t mention Crate and Barrel and instead give a Dansk phone # and the website. No, you’re probably right, Anna. Now that I see the photo on AT from earlier in the year it looks like all the pieces are there… it’s just the butter warmer that has the knobby end! I kind of love the pale teal color from the vintage pieces collection. When I worked at True Value Hardware store growing up (Housewares was my life) I brought home many pieces from Dansk, as well as Corelle (Dinnerware), Corningware, Farberware (stainless steal) and another brand of enameled cookware that escapes my memory at the moment that was imported from Italy! I’m gonna be thinking about that Italian brand all day until I figure out the name, ugh I hate when I can’t remember stuff like that! At any rate, I love the handle bar/trivet feature on these casseroles, what a great idea! I’m revealing a whole lot regarding my obsessions with kitchen cookware and kitchen gadgets (don’t get me started on kitchen gadgets) but I used to go to the Dansk Factory Outlet in Woodbury Commons and actually get excited….this was many years ago when I was 15, didn’t have an apartment or the desire to cook anything! Swiss mom-out-of-law IN SC has (full?) set all in YELLOW. Probably bought it in 1956. Still using, still looks great. Swiss tomatoes in rectangular casserole the best. We have medium size w/ lid in BROWN and have used it forever; still the best for many things, and we have lots of copper, etc. Wore OUT a BLUE wood handled little pot like you show heating milk for coffee for years and years. Or maybe our friend took it with her to Laguna when she went west. The kind of thing you cannot get rid of, even scorched. Like family. That´s exactly why I left space for 9 kg extra luggage in my backpack when I came to the USA! Hope to find a kobenstyle pot in SF – vintage or new! I have one hand-me-down Kobenstyle pot in brown. 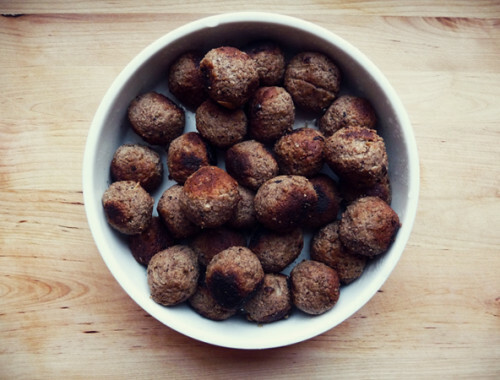 For whatever reason, my mom only ever used it to cook meatballs in red sauce, and because of that long-term association that’s all I ever cook in it too. I love the style, and in a more modern color like these new ones from C+B, it would be a lovely functional display piece. That’s so true, Amy. There are a couple of pieces of cookware and servingware that my mother has had forever and always uses for specific foods, and I know exactly what you mean about only being about to use them for the same things! But, that didn’t stop me from adding a couple pieces to the wedding registry……! I worked in the Dansk store in Mount Kisco, NY when I was 21 (a long time ago) and was lucky enough to buy a lot of these pieces in red, blue and yellow. I still have them all and they still look great – shiny and bright colors. Definitely get the small butter warmer – it’s really handy – I use it for oatmeal, rice, etc… Also, I find the 6 quart casserole too big and use the 4 quart more often. Remember the bottom is thin (like a normal pan) so it’s quicker to burn than if you were using a Le Creuset pan. Once you get used to it it’s no problem. If it does burn – it’s easy to clean – the white always stays white. 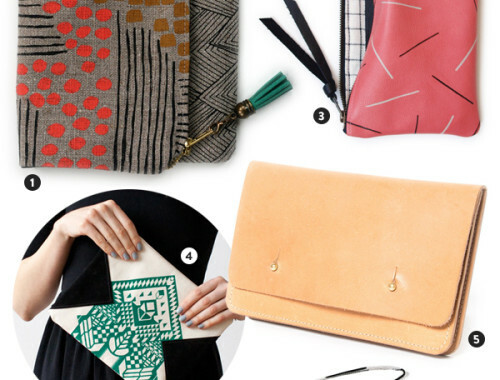 Definitely get them – you’ll love them. Wow! I love these in black and Crate & Barrell now ships to Australia. The temptation is almost unbearable. I’m the owner of the collection you linked to. I just wanted to throw my two cents in on this. I’m glad C & B is carrying Kobenstyle. I know some parts of the world can’t get their hands on the vintage pieces however I’m bummed that they’re charging SO much for them and that they’re being made in Thailand not France or Denmark like the originals. Oh Anna – if I’d only known… I just got rid of a complete set of Kobenstyle in Black that I had aquired when I worked for DANSK in Woodbury Common/Mt Kisco and Cohoes Factory Outlets. They were heavy and were prone to chipping if not handled just right. I’d never used them and the set had been in storage for so long, I finally just decided to sell them at a yard sale. My mother has a few of the pieces in Yellow and White. Brigidanne, did you just sell them over the weekend?? If so—my mother was at your yard sale and contemplated buying them! Hopefully the leg is still attached to the cow! Kobenstyle means Copenhagen style. It’s written Købenstyle in danish. And the capital of Denmark is København (=Copenhagen). Hi. Just saw your sight and noticed the pan. We were given one just like it in 1988 that is a very pretty blue. Interesting. I had to check out the C & B site after reading this… was turned off that the pieces I looked at were made in Thailand. Where were the vintage pieces made? I love these colors! We live here in Denmark and see the vintage pieces all the time, but even though I have bought a few pieces, I keep them tucked away, which is kind of sad. I do still love catherineholm’s designs and just wish they would reissue it in black and white! I’ve never seen anything but orange or aqua at the flea markets. My aunt and uncle used to buy these at the Dansk outlet in Freeport, Maine and give these to everyone in my family for Christmas back in the ’80s, so we all (aunts, uncles, cousins, brothers, sisters, parents on that side of the family) have at least three sizes in different colors in our kitchens. It’s kind of funny because we have very different styles from minimalist to bohemian, strictly Danish to traditional English antique freaks, but we all LOVE these pots. They have held up very well for decades and I use mine all the time. I only wish my Aunt Sally would trade me her sunny yellow huge pot for my navy blue one! Wow I have one of these from the first time around! I think it was a gift for graduating from college and I graduated in 1975! Don’t use it much – think I’ll dig it out and maybe get another to match it! I am sure you have now seen the yellow Dansk at Crate and Barrel. However, I can only find the frypan on one site (I am sure it is from the original dans) for $374. Has anyone found a frypan on the reissue items? Various different colours are being sold by different retailers. The MOMA store has it in GREEN! !